I arrived in Pyongyang Saturday afternoon and was met at the airport by Mr. Sin from the Paektusan Academy and my interpreter, Mrs. Kim. My seatmate for the flight was a young man from Alberta, Canada, who was traveling with his wife and two sons and 11 other Canadians who are coming to Pyongyang to teach English for three months. This is one of the few cases I’m aware of a longer stay being allowed for western visitors. Things seem to be changing in the Democratic People’s Republic. At the airport I happened to meet the British Ambassador and the Hong Kong representative of the ATPN news group—a providential meeting perhaps. On the drive into the city I noticed some change. There are massive renovation projects going on—the Cultural Hall and the National Theater are both being redone. The Academy of Architecture building is as well, which means that our working meetings will be here at the Koryo Hotel. 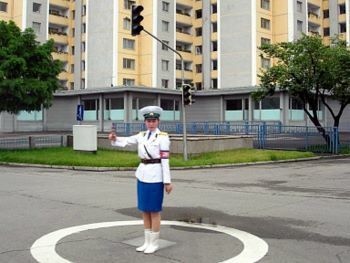 Traffic lights have been installed and there are fewer of the blue and white clad traffic directors on the streets. The street that the Koryo sits on has been redone with new shops, neon signs, street lights and grass. I’m not sure what’s going on, but the improvements belie the prevailing notions about the economic condition of the country. I went to services today at the Bongsu Church. Pastor Son and the congregation greeted our little group of Americans warmly—I went with a delegation of doctors from Florida who are here doing heart surgery. It’s a Protestant church, one of two here in Pyongyang. There’s also a Catholic and possibly an Orthodox one as well. Freedom of religion is a right but there are very few active believers. The service was lovely. The choir was powerful. The sermon dealt with trust and faith taken from the reading in Romans 14: 22-23. They had simultaneous translation so we were able to follow along. There were some English hymnals, but I wasn’t close enough to one to do more than hum. The closing hymn, though, was God be with You til We Meet Again, one of my favorites so I sang lustily as we marched down the aisle. I got some video–check it out below. It was a great beginning to what will be a very important trip. If you’d like to be considered to be part of the upcoming work teams, submit this form. Learn more about the DPRK peacemaking initiative here. Congratulations for this testimonial information. I’m happy to to see the work that is beginning in this country that so needs a friendly hand. It is a great Christian testimony to work in this country. What make’s me happier yet is that there is room to glorify the Father.